Definition at line 74 of file lscript_bytecode.h. Definition at line 228 of file lscript_bytecode.cpp. 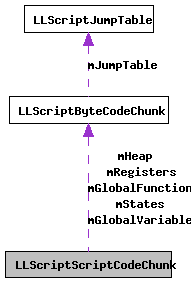 References FALSE, mGlobalFunctions, mGlobalVariables, mHeap, mRegisters, and mStates. Definition at line 238 of file lscript_bytecode.cpp. References mCompleteCode, mGlobalFunctions, mGlobalVariables, mHeap, mRegisters, and mStates. Definition at line 248 of file lscript_bytecode.cpp. References bytestream2u64(), gErrorToText, llendl, llwarns, LREG_BP, LREG_CE, LREG_CS, LREG_ER, LREG_ESR, LREG_FR, LREG_GFR, LREG_GVR, LREG_HP, LREG_HR, LREG_IE, LREG_IP, LREG_NS, LREG_PR, LREG_SLR, LREG_SP, LREG_SR, LREG_TM, LREG_VN, LSCRIPTStateBitField, LSERROR_ASSEMBLE_OUT_OF_MEMORY, LSL2_CURRENT_MAJOR_VERSION, LSL2_MAJOR_VERSION_TWO, LSL2_VERSION_NUMBER, LSTT_STATE_ENTRY, LLScriptByteCodeChunk::mCodeChunk, mCompleteCode, LLScriptByteCodeChunk::mCurrentOffset, mGlobalFunctions, mGlobalVariables, mHeap, mRegisters, mStates, mTotalSize, S32, set_event_register(), set_register(), and LLScriptGenerateErrorText::writeError(). Definition at line 88 of file lscript_bytecode.h. Referenced by build(), and ~LLScriptScriptCodeChunk(). Definition at line 84 of file lscript_bytecode.h. Referenced by build(), LLScriptScriptCodeChunk(), LLScriptScript::recurse(), and ~LLScriptScriptCodeChunk(). Definition at line 83 of file lscript_bytecode.h. Definition at line 86 of file lscript_bytecode.h. Definition at line 82 of file lscript_bytecode.h. Definition at line 85 of file lscript_bytecode.h. Definition at line 87 of file lscript_bytecode.h.